Central Arts 12" square coffee table books are available now. $100 for basic book (70pp) and $125 for Rintamaa Anniversary Edition (90pp). The basic book ends with the series of collages about the music program at Central. 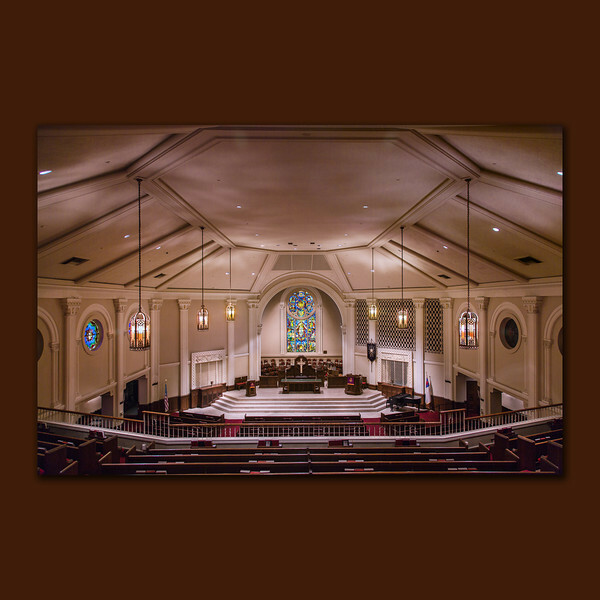 The Rintamaa Anniversary Edition contains 20 more pages of detail about Michael Rintamaa and an inside look at the Chancel Choir.The book features the extraordinary art in Central Christian Church (Disciples of Christ), Lexington Kentucky. See pages from the book below. Contact John Lynner Peterson to order the book. Proceeds for Central Organ Restoration fund. Individual art is also available in traditional prints, or on glossy metal. Special orders of any of the art in the book are available. John Lynner Peterson is a professional photographer based in Lexington, KY. He is a native of Minnesota. His passion for photography intensified in the late 1960's when he served as a teacher in Papua New Guinea. He traveled by small plane, motorcycle, 4 wheeled vehicles and canoe in that challenging tropical environment. John traveled across South Asia and an overland trip by bus from Kathmandu to London, where travel is now extremely hazardous or impossible. Unique documentary photographs resulted. Earlier in his career, John was a marketing and communication executive for national and international Christian, ecumenical and interfaith organizations. John and his book editor and wife, Brenda Bartella Peterson, live in Lexington KY. They enjoy their grandchildren and the rich music programs of Central Christian Church.